Vernon Bruce Dent (1895 – 1963) was a comic actor who co-starred in many short films for Columbia Pictures, and is best remembered today for his frequent appearances in the Three Stooges short films as antagonist to the Stooges. Vernon Dent was born on February 16, 1895 in San JosÃ©, California, U.S.A. He was educated in San JosÃ© and Oakland, California. By 1919, Hank Mann of the Keystone Kops “discovered” him and recruited him for 1-reel comedy short films for Arrow. By this time he was already touring southern California as part of a singing troupe, and was an accomplished song writer. By 1921, Vernon Dent was making one reel “Folly Comedies” for the independent Pacific Film Company. By 1923, Vernon Dent was hired by Mack Sennett, and made numerous short films with comedy film star Harry Langdon. The two performed so well together that, when Langdon began making short films for Educational Pictures, he hired Dent and gave him second billing. In 1935, he began his longest career with a film company when he signed with Columbia Pictures short film department, where he began making comedies with the Three Stooges. After joining Columbia Picturesâ short-subject department, Vernon Dent went on to work with practically every star on the payroll, including fellow Sennett alumni Harry Langdon, Andy Clyde, Charley Chase, and Eddie Quillan; The Three Stooges, Buster Keaton, El Brendel, Vera Vague, Hugh Herbert, Schilling and Lane, Harry von Zell, and Bert Wheeler. Vernon Dent appeared very occasionally in feature films, including Million Dollar Legs, Chip Off the Old Block, and Kill the Umpire, but was much more visible in two-reel comedies. In addition to a long list of appearances in Three Stooges short films, he also began a lifelong friendship with Shemp Howard of the Three Stooges. When Shemp finally died, Emil Sitka accompanied Vernon to the funeral parlor to pay his respects to his friend, Shemp — Emil needed to accompany Vernon Dent since, by that time, Vernon was blind — a complication from the diabetes that Dent suffered from. 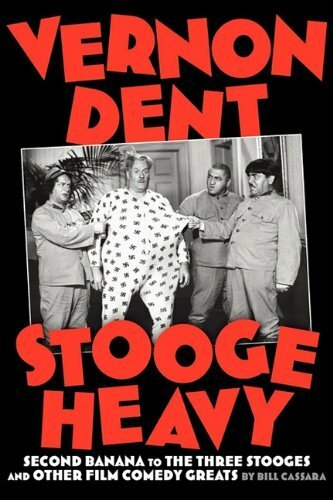 Even after losing his sight in the early 1950’s, Vernon Dent continued to appear in Three Stooges short films, (in a stationary or seated position) through 1954. He participated in the nationally televised This Is Your Life tribute to Mack Sennett. Vernon Dent died of complications from diabetes (according to his wife, Eunice, he died of a heart attack) on November 5, 1963 in Hollywood, California, U.S.A., and is interred at Forest Lawn (Hollywood Hills), Los Angeles, California, USA. THE PHONE BOOTH SCENE!!! LOL!!! (Larry, Moe and Shemp get trapped in a 40″ x 40″ steel-doored phone booth….along with VERNON DAVIS and his daughter Nora’s “Wedding Cake supplies” (Frosting, milk, EGGS!!! )”….and $13 in nickles.